This post is about a slightly obscure, but very important, issue. Should we use geometric or arithmetic means of returns to evaluate investments? This might seem boring, but answering this will help us with some other serious problems: Does diversification increase the expected value of your portfolio or just reduce the volatility? If so can we then afford to pay extra costs to get diversification? Does adding a small amount of bonds to an all equities portfolio increase your likely returns? It turns out that the answer to this boils down to one of the most fundamental questions in financial economics: How should we evaluate the expected value of possible outcomes? When thinking about past and future returns I'm going to be using geometric means rather than the more common arithmetic means. Geometric means reflect what you will actually earn over time. To understand this better let's look at an example. Consider an investment in which you invest $100 and earn 30%, 30% and -30% over the next three years of returns. The arithmetic mean of returns is the sum of annual returns, 30% + 30% - 30% = 30%, divided by the number of years (3), which equals 10%. You might expect to have an extra $30 after three years: probably more with the magic of compound interest. Notice that the annual return here is much lower, just 5.76% a year, but it's consistent. The final account value after three years is exactly the same as in table 1: $118.30. The geometric mean of a series of returns is the consistent return that gives the correct final account value. So the geometric mean of 30%, 30% and -30% is 5.76% a year. Mathematically the geometric mean is [n√(1+ r1)(1+ r2)....(1+ rT)]-1 where rt are each of T returns. 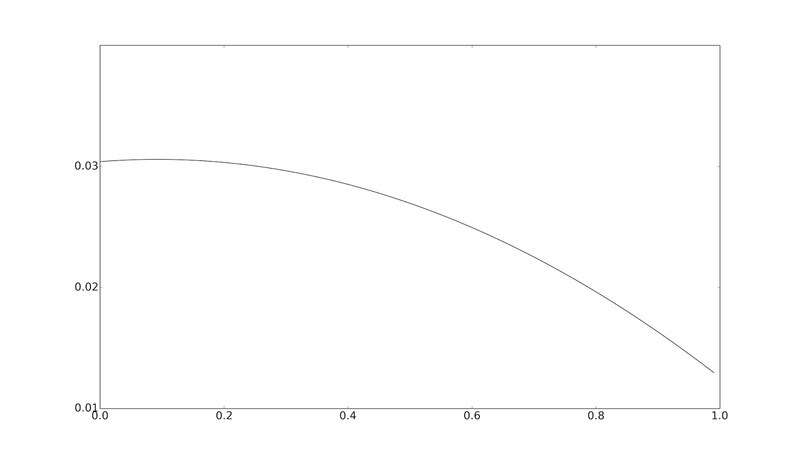 Alternatively it's exp[(1 ÷ N) Σln(1+rt))] – 1 where ln is the natural log, and exp is the exponent function. Notice that the geometric mean is a concave function of the final value of the portfolio (1+ r1)(1+ r2)....(1+ rT). This is an important point which I'll return to later. I am unlikely cheerleader for geometric returns... until a couple of years ago I'd never actually used them! That's because in the hedge fund world where we rebalance to target expected risk on constant capital it's better to use non compounded curves (See this post for more). It's not necessary to use geometric returns since there no compounding and the volatility of different options is identical (expected risk on target), rather you can use arithmetic returns and make your life easier (you can also focus entirely on Sharpe Ratios, since you effectively have as much leverage as you need to maximise returns for a given level of risk target). Geometric returns give a more realistic picture than mean returns. To take an extreme example consider the following series of returns: 100%, 100%, -100%. The arithmetic return is 100%: What a fantastic investment! But the geometric mean is easy to calculate: 0%. You will have nothing left after three years have passed. ...where μg is the geometric mean, μa is the arithmetic mean and σ_2 is the variance of returns. In other words the geometric mean is the arithmetic mean, less a correction for risk. It's worth emphasising this: the benefits of diversification are greater when average returns are measured with geometric means. Geometric returns get higher as risk falls, something that never happens with arithmetic returns. Take a group of similar assets, like equities in the same country and sector. It's not unreasonable to assume they have equal arithmetic returns, equal standard deviations (and thus equal Sharpe Ratios - and equal geometric means) and identical correlations. The optimal portfolio here has equal weights and as many assets as possible. But adding these assets doesn't affect the arithmetic mean, which is unchanged. It reduces Sharpe Ratio, rapidly. But is also improves the geometric mean, a little more gradually. We can also use geometric returns to "pay" for higher diversification costs. If you can get an extra 0.5% in geometric returns then you can pay 0.4% more in costs and still be ahead. This explains the weird title of the post: we can "eat" higher geometric returns, or use them to pay higher costs. Also using geometric returns is part of the way past the classic portfolio optimisation quandry: should we opt for a portfolio with higher return (more equities), or lower risk (more bonds)? The maximum Sharpe Ratio portfolio is just one possible compromise between these two options. But for those with a higher tolerance for risk it is inferior to options with more return. The maximum geometric mean portfolio is interesting. It's the portfolio for which there is no point increasing risk further, even if doing so gives you a higher arithmetic return. So an interesting implication is that adding a small amount of bonds to an all equities portfolio will increase geometric return: or to put it another way all investors should own some bonds. Adding a few bonds to all equities portfolio has left geometric return the same. In fact the maximum geometric mean occurs at roughly 10% of the portfolio. Only once we add more than 20% of bonds to the portfolio does the geometric mean fall below the all equity portfolio. ...h/t to Daal on elitetrader.com. A key misconception concerning the expected geometric mean return is that it provides an accurate indication of long-term expected future wealth. An asset’s expected geometric mean return (i.e., the expected compounded rate of return) is the probability-weighted average of all of the potential realized geometric mean returns. ...volatility does not diminish expected value. 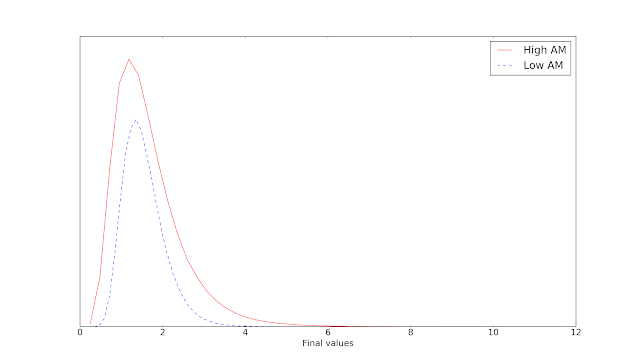 geometric mean scales (concavely) with final portfolio value. These apparently arbitrary values have been chosen so that both assets have the same geometric mean. The mean of the distribution (i.e. 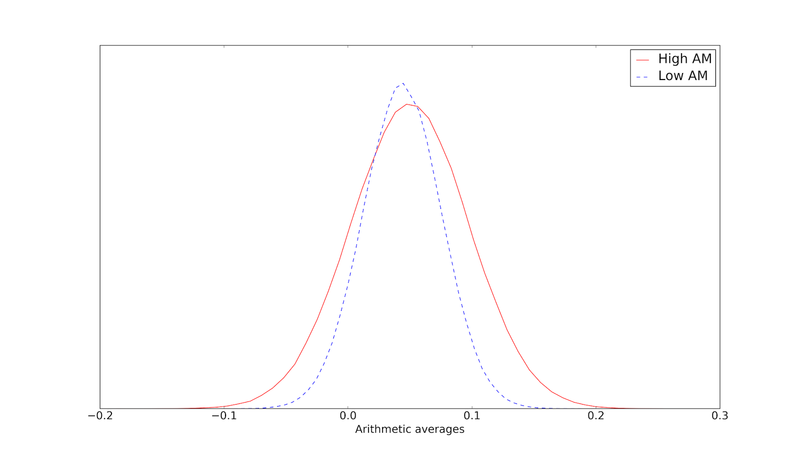 the expected arithmetic mean returns) are: 4.99% (High AM) and 4.38% (Low AM). This verifies that the Monte Carlo hasn't done something weird. You can see that both assets have the same expected geometric mean, though there is more uncertainty about the estimate for the higher volatility "High AM" asset. Now this distribution is more interesting. 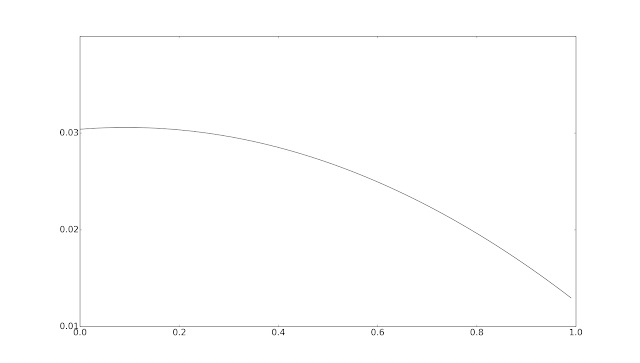 Even if you squint really hard it isn't Gaussian - it's a skewed lognormal. The bunching of values on the left hand side is happening when a lot of losses occur in a row. Because we're not using leverage the portfolio value can't go below zero; hence we get bunching. The means of the distribution are: 1.65 (High AM) and 1.55 (Low AM). These are the key numbers. Although both assets have the same geometric mean the final portfolio value is larger for the asset with a higher arithmetic mean. It certainly looks like the geometric mean is in trouble. The expected final value of the portfolio is the probability-weighted average of all of the possible portfolio final values. Expectation: A word we use a lot in economics and finance without a pause. What does it mean? And also, and very importantly, which average? When I was at school we learned about three: the mean, the median, and the mode (which I won't be using here). Remember from the figure above that the distribution of realised final values is right skewed. Hence the mean will be greater than the median. So the choice of average matters a lot. 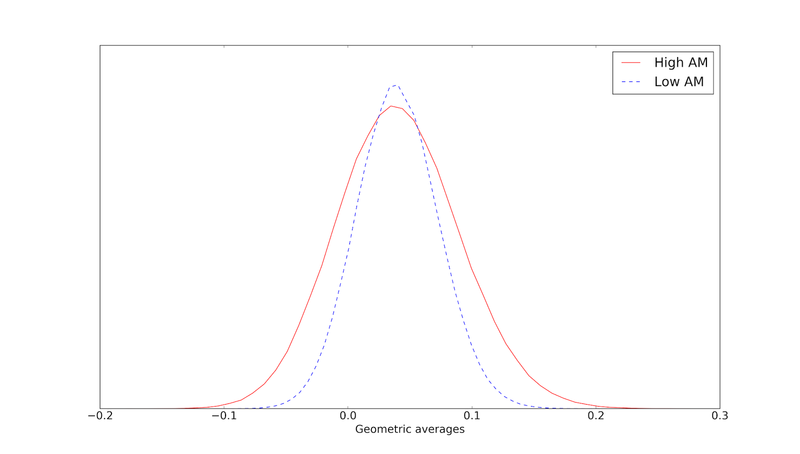 The paper assumes that the probability weighted average of all potential portfolio values is the mean of the distribution of possible portfolio values. The expected final value of the portfolio is the probability-weighted average of all of the potential realized portfolio final values. In the paper this is the mean of the distribution of possible portfolio values. The case against the geometric mean relies heavily on using the mean, not the median, to summarise the distribution of final portfolio values. All this matters because we're dealing with a distribution where the mean and the median are significantly different. Does risk neutral behaviour exist? Using the mean makes sense for risk neutral investors. Let's take a simple and rather extreme example. Suppose your entire wealth is £100,000. I offer you the chance to buy a lottery ticket for £100,000, which will pay you £100 million, at odds of 999 to one. The expected value of the ticket using the weighted average mean of the outcomes is £100,100. For an economist this bet is worth taking! Taking the arithmetic mean of the distribution leads us to prefer an outcome that is completely and utterly insane. No human being would ever gamble everything they have for such a tiny expected average increase in wealth. People only take on those kinds of gambles for relatively small fractions of their wealth (so yes they do buy lottery tickets, but not for £100,000). There are definitely risk averse people: I am one myself. So if there are risk lovers then there must also be risk neutral investors; it makes no sense to have a continuum with a break in the middle. Looking around it does look like some people seem to love risk to the point they'll happily pay for it: eg gambling in casinos when the odds are against them (which they nearly always are). If these weirdos exist it does seem more plausible that risk neutral investors also exist. However I would argue that true risk loving behaviour doesn't exist. Instead this behaviour is a result of people misjudging probabilities due to cognitive biases in the way we think about risk. The cognitive science hadn't been incorporated into financial economics when the idea of the continuum above was proposed. We know that people overestimate the likelihood of events with very small probabilities (which is one reason why people do buy lottery tickets which cost only a fraction of their expected value even though they always have a negative expected value, and buy insurance against terrorist attacks). If you ask a desperate gambler who is about to put the last of their money into the slot machine if they expect to win on this spin their answer will be "of course"; probably because they suffer from gamblers fallacy and believe they are "due" a win. Similarly the most aggressive investors invest in highly speculative portfolios of rubbish companies with almost no diversification; which on the face of it would only make sense if they were risk loving. But I would argue - again - that is a failure of probability assessment. Yes the investors say we know that diversification is better, but we have skill and can pick the best stocks. They overestimate their probability of beating the market - all of them are above average - the Lake Wobegon effect. Cognitive failure leading to probability mis-assessment is mistaken for risk loving behaviour by economists. This is wrong. With no risk loving investors I also believe risk neutral behaviour is also a myth. In reality everyone requires some compensation for risk. As humans when we think about expectations it is the median that we are thinking about. If the weather forecast tomorrow is for a 10% chance of rain, and I ask someone what they expect the weather to be, they will say they expect it to be dry (the median outcome). They won't say they expect it to be a little bit wet (the mean outcome). The £100K lottery may be an extreme example but as we've already seen future wealth is always fairly heavily right skewed; enough so that the difference between mean and median is pretty significant. Cross sectional distribution of wealth and income in the real world is also famously right skewed. Would you want to live in a country where there is a tiny chance of being very wealthy, but you're most likely to be dirt poor? (Hint: net migration from the very equal Nordic states to much less equal America is almost zero). Would you want to do a job where you have a miniscule chance of earning millions, but will probably barely earn a living wage? (Again a lot of kids - or their parents - want to be professional footballers, but this is a judgement error that comes from overestimating the probability that they personally will make it to the top leagues). I think the correct way to evaluate future wealth outcomes is by using the median. To most people the idea of "I expect what will happen is what is likely to happen half the time" is a more natural concept of expectations than "probability weighted average mean". In an ideal world you'd show people distributions and explain the uncertainty involved and then get an idea of their risk / reward payoff function. But short of that I'd say that even the least risk averse humans on the planet should use the median outcome when evaluating future investments. Returning to the plots above what figures do we get if we summarise the for the median rather than the mean? Remember that High AM has a higher arithmetic mean than Low AM, but both have the same geometric mean. 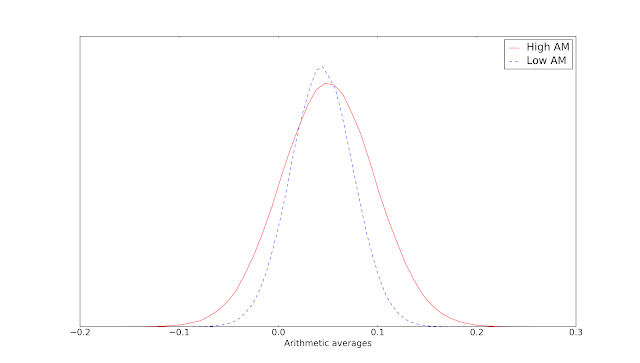 The expected value (using the median) of future wealth is identical when geometric returns are identical, even if the arithmetic mean is lower. I think declaring the death of geometric returns is somewhat premature. It's true that using the classical economists view of expectation - the mean of the distribution of portfolio values - implies that final value isn't lowered by volatility. But this vanishes when you use the median of the distribution as your basis for expectation. I feel personally that using the median, rather than the mean, is the correct approach. However this is an ideological debate - there is no right answer. Ultimately an economic model is a simplification of the vastly complicated reality of human behaviour.